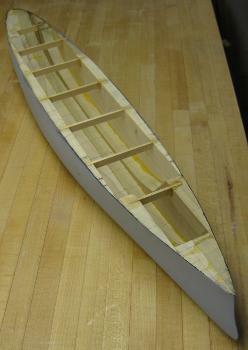 Model Boat Hull Design Notes – Building tips for hard chine and round-bilged hulls using planking or carving methods. 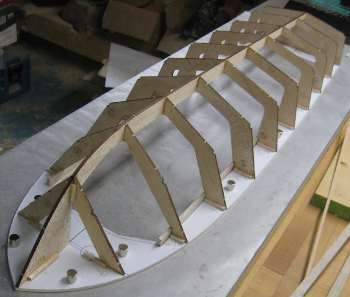 Here is an attempt at demystify model boat hull design and construction. The hull is typically a big part of your model boat building effort, especially for scratch-building. If judging from my own experience, most projects I’ve abandoned were during the hull building phase, often because I didn’t plan the construction in enough detail before cutting and gluing. Once planks are laid or chips carved, it's often difficult to go back and make corrections. Some of my abandoned efforts also came s a result of snags I'd been unable to see before starting out. I'd chalk that up to lack of experience. Hopefully, these notes will help you avoid repeating my mistakes and increase your odds of successfully finishing your hull. I suppose this page can also be helpful in reviewing different types of kit constructions and the various hull materials used. In a nutshell, this is meant to be a road-map for anyone curious about model boat hull design options. Much of this page is a collection of free-floating thoughts, ideas and experience that I've collected over the years. Hopefully they'll help you succeed with your model by laying out different options for boat hull design and construction. Each can then be further broken down, and in many instances, combined. Some may say casting is another method to create a model, and I agree that is true to a point. I did not include that as a separate category, since the master (or plug), most likely, has to be created from one of the methods mentioned above. What most planked hulls have in common: bulkheads. The bulkheads, keel, deck and transom form a frame to be planked. Here is a hard chine hull almost ready for sheet planking. A planked hull has a number of bulkheads or frames, and a keel or keelson that form a structure. This structure is then covered in a "skin", i.e. planking. Sometime, a hull can be planked using sheets of plywood, balsa, basswood or even paper or card stock. A flat building surface is used as a reference and the hull structure is held down with weights, clamps or fasteners. How flat is "flat", you ask? A very slight bow is probably not going to hurt. However, twist in your reference surface is your number one enemy. A hull that has a noticeable twist in it is often beyond saving. The kit manufacturer Billing have kits that are built one half at a time and later assembled. I can see there are some benefits to the method, but it comes at a price. The method relies heavily on your building surface being perfectly flat. It also flies in the face of conventional ship building wisdom where the strain on the structure is largely cancelled out by building up the hull symmetrically. As just mentioned, the planking process is best done symmetrically – i.e. as one board or strip is glued down, alternate and attach the corresponding board/strip on the opposite side. Probably the most often confused model boat hull designs are Plank-on-frame and Plank-on-bulkhead - strictly speaking, they are not the same thing. Plank-on-frame mimics the way a full-size ship was built, from the way the frames are constructed, to the width and joints of each strip as it is planked. In the end, some hull planking is often left off to show the arrangement and construction of the frames. This is hard to do. Plank-on-bulkhead is much easier and is how most kits are constructed. Bulkheads are often made of plywood and spaced much further apart than the frames in the plank-on-frame method. Many kit manufacturers and retailers of ready-built models purposely confuse the terms. Not too surprising. 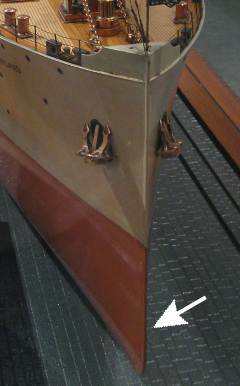 Plank-on-frame is often considered the most sophisticated form of model ship building. Another term, abused by the same offenders is "museum quality". If you read or hear that term, run the other way. The thinner the planking material, the better it takes a bend, and the less stress it puts on the structure as a whole. On the downside, thin material need more support, so more frames or bulkheads are needed and placed closer together. 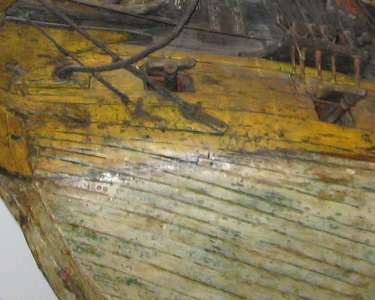 A close-up of a plank-on-frame model hull. Notice how the planks have a very subtle taper towards the end of each run. A "Folk Art" model at the Mariner's Museum (Hampton Roads, VA). The "correct" way to plank a hull requires each board to be tapered towards the ends and sometimes stealers need to be used where necessary to close gaps. If the previous sentence was all Greek to you, then stick with plank-on-bulkhead. I've heard a general rule not to place bulkheads more than two inches (50 mm) apart. I’ve seen exceptions to this – for instance: most Glynn Guest designs rarely have more than two or three bulkheads over a 30 to 40 inch length. They are all planked with balsa sheet. Another exception: I built a Steingraeber (the company is now defunct) kit of the French destroyer "Surcouf" at 1:100 scale. It had plywood bulkheads about 4-5 inches apart and planked with 3mm basswood strips. When all else fail, heat and moisture can make strips bend easier. Since the strips are now forced to take a shape, you’ve got to watch and make sure it follows the true shape of the hull. Some material bend easier than others. Most notably different wood species handle bends better. Some of the best woods for bending are Walnut and Ash. The worst ones are softwoods such as Spruce, Cedar and Pine. I advice against using metal nails for fasteners. Metal nails are a nuisance when it comes to sanding the hull – they’ll cut your fingertips. Add to that, they always seem to look out of scale. A better option is to make treenails and peg the strips in place. For appropriate sized model boats, staples can be used, but they tend to beat up the wood pretty bad and sometimes split the strips. Not a big deal if the hull is to be Bondo-ed, fiber-glassed and painted. The featured RC PT boat is a good example of a simplified hull being planked with sheet (balsa in this instance) for easy construction. Here is a laminated hull block (AKA Bread-and-Butter) of USS Olympia ready to be carved and faired up to a smooth hull. Traditionally woods, such as Mahogany, Balsa and Basswood, are the most frequently used materials, at least in North America. Other popular woods include Alder, Poplar, Yellow Pine, Cherry and Walnut. Some woods are less suitable, generally because they are either too hard or not particularly stable. For instance, I would not try and carve Oak or Hard Maple. American Beech is unsuitable, first because it is very hard, and secondly it is not stable and seems to have a mind of its own (warps). All said, there is no reason foam materials could not be used, such as polystyrene or "hard" polyurethane. These materials are commonly used when making surfboards for instance. One big benefit to a carved method is that there is very little stress and tension in the structure to contend with during the construction process, as opposed to those in any of the planked methods. Therefore the need to rigidly hold the hull during construction is merely a matter of convenience rather than necessity. This is the same USS Olympia hull after several hours of removing material. For Bread and Butter (aka Laminated hulls) there is a caveat: Laminating many thinner boards make the job of carving a lot easier, not only physically, but also visually, since there are more joints that help guide you find the true shape of the hull. Unfortunately, thin wood is often more expensive by volume than thicker wood of the same species. Several thin layers require more work in the front-end: many layers are needed of the more expensive material, more transferring from templates and cutting out, more complicated aligning and gluing up. On the other hand, shaping an intricate hull of modest size with just a few boards will no doubt save money, but will be more difficult to shape properly. As an example, The USS Olympia (pictured elsewhere on this page) at 1:144 scale with only six layers of 4/4 lifts was a challenge. In hindsight, I should have doubled the number of lifts and gone with 3/8-inch thin wood. I tend to try and stick with trade sizes of lumber: FAS 4/4 S2S. 4/4, which is typically 3/4 - 13/16" thick (19 to 20.6mm) May not be the best choice for your first B&B model, but trying to make it a goal to conquer the technique to the point you feel comfortable shaping a hull from common size material will save you money. Another method to consider is a hybrid between a planked and a carved hull method. Typically the lower part (under and including the bilge) are made up of a solid piece or laminated boards and, the sides are covered with sheets or strips of plywood, styrene, card stock or wood to form a complete hull. This method saves material and weight over straight Bread and Butter and is typically faster to build than a regular planked hull. It's relatively common for semi-scale working models where there is more leeway in regards to accurate representation. A hybrid built approach is especially suited for large warships, cargo ships, tankers and the like, where the sides are flat or near flat. This method typically leaves more room for running hardware, motors and RC gear than you'd see in a B&B hull. Here is a list of the most common model boat hull designs that you’ll typically encounter. Often a sheet planked hull is faster to build than one planked with strips. The time saved is two-fold: less bulkheads to cut out and line up and only a couple of strakes of planking. Most hard chine boats are either small to medium sized motor boats, such as launches, torpedo boats, speedboats or small and modest sized sail boats. However, many modern tugs, commercial fishing boats and work boats have also been designed this way. This boat hull design is often suitable for sheet planking which will save a lot of time as stated earlier. On the other hand, be aware that just because a hull is hard chine, doesn’t automatically mean it can be planked with sheet. Good examples are the Elco PT boats and many launches and motor torpedo boats by Vosper and others. The side and bottom panels on these boats are actually scalloped (or concave) when looking at the original hull sections. The hull shape, and thus all bulkheads, has to be altered in order to be planked with sheet material. Most builders would agree that for working models especially, simplifying these hull forms (to accommodate sheet planking) is not a serious offense even to the most hard-nosed scale model aficionados. A hull being hard chine doesn’t automatically make it easy to build. If you’re looking for easy, look for a straight shear line (where the deck meets the upper part of the hull) or another flat plane that can be laid flat on your building surface. A round bilge hull can not be planked with sheets, but has to be either carved or strip planked. A long and narrow hull will be a lot easier to plank than one that is short and wide. Planking a round-bilge hull with sheet material, the way paper models often are constructed, is by all accounts a compromise. You also see build logs in forums, often scratch-builds, done this way with styrene sheet. In this method the fitted panel span only between two bulkheads, the keelson and to a false deck at waterline (for instance). It’s a convenient solution for paper or styrene, but it's difficult to finish into a true and smooth hull this way. Note the razor-sharp entry at the stem. It takes some serious skill and a steady hand to be able to recreate on a model. The model is the S/S Kroonland at the Mariner's Museum (Newport News, VA). It seems to work well enough if the model is kept relatively small. The larger the hull, the more noticeable the staggered shape will be. Also, the more bulkheads and closer together, the smoother the result. For late 19th and 20th century steel hulls, I’d use solid blocks at the extremes whenever suitable. It is very difficult to get plank strips to form that sharp entry of a full size vessel – it always end up blunt. Using blocks at the stern you’ll bypass the headache of tight bends and awkwardly tapered strips. Naturally, this is not an option if the planking is exposed, but works great for hulls that are painted. Whenever scale appearance comes second to simplicity, some round bilge hulls can be simplified by converting them to some form of hard chine design. Large ships for instance, can often be built up with balsa or basswood sheet of appropriate dimensions and sanded to take on a more rounded shape. 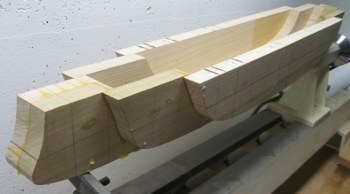 The thicker the planking, the more material will be available to form a rounded bilge and other joints. Trimarans - three connected hulls, where the middle typically is larger than the other two. The "outriggers" are identical. Proas - two unequal hulls. Generally associated with sailing vessels of the Pacific Islands. Multihulled vessels are built for speed and economy. Many sailboats and power boats for racing have this type of hull. Some small to medium sized passenger ferries have been designed with multihulls for speed and economy. Multihulls are generally not considered as seaworthy as monohulls. Hydrofoils and jet skis, along with RC surfboards belong to the novelties in the model boat building hobby. There have been kits and RTRs, but most seem to have come and gone. RC submarines on the other hand have a strong and dedicated following.